Making The News Canada: First it was Unbundled. Now is it Time for the Media to be Unscaled? First it was Unbundled. Now is it Time for the Media to be Unscaled? Are you ready for a magazine called "Me"? In a previous post, I wrote about how the media had become unbundled. That process is pretty much complete. As I wrote earlier, the media became bundled as a way to most efficiently and effectively serve its customers. It was not profitable, or even possible, to deliver each article the moment it was finished. So publishers collected articles into daily, weekly and monthly bundles called newspapers and magazines. They then delivered these bundles of information to readers. This bundling had the positive, and perhaps unintended, effect of being attractive to advertisers, who wanted to reach the most people. Then the Internet came along and disrupted this practice of bundling. Now that the barrier of cost and efficiency was eliminated; single articles could now be shared immediately and inexpensively. There was no need to bundle them together anymore. Since the media's business model was built on bundling, and with it the ability to attract advertisers, this was devastating. Since the early 2000s, advertising revenues have been falling. In the U.S., newspaper advertising fell from $49 billion in 2006 to $18 billion in 2017. But if unbundling was the cause of the problem, can it also be a solution—from an advertising point of view? 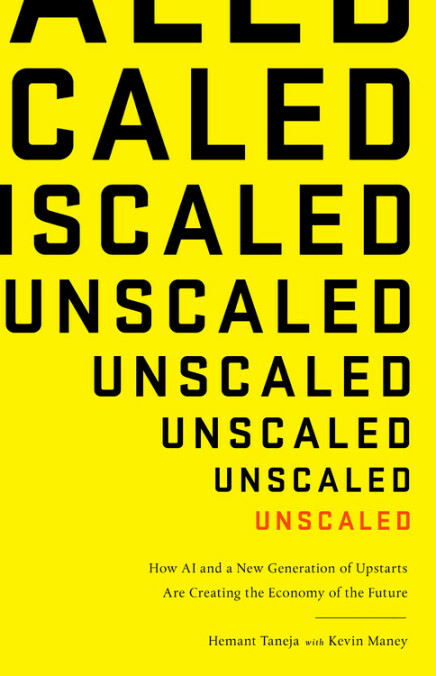 Yes, say authors Hemant Taneja and Kevin Maney in their new book Unscaled: How AI and a New Generation of Upstarts Are Creating the Economy of the Future. In it, they say the main idea behind business in the 20th century was to get bigger—to scale up. The reason was simple: By being bigger, they could take advantages of economies of scale. For the media, this meant newspaper chains buying more titles, and broadcast companies buying more stations. That way, they could attract more eyeballs, making them more attractive to advertisers (especially national advertisers). 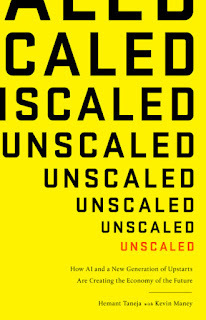 But this traditional idea of “scaling up” in business has been disrupted. Today, most advertisers aren’t interested in reaching the masses. They are more interested in reaching individuals who are interested in their products—micro-targeting. And so they have fled things like traditional newspapers, TV and radio for platforms like Google and Facebook where they can put their ads in front of people who want to see them. For the media, this is a huge loss. But, the authors say, it may also be an opportunity. It means moving from a mass market—larger circulations or listeners or viewers—to an audience of one. Through AI, the media can now learn exactly what I am interested in reading, seeing or listening to. It can then create special editions or channels for each reader, viewer or listener—a product geared just to me. This now becomes attractive to advertisers, who can target their ads to me and what I am interested in. “AI holds the key to media profits. The most valuable advertising online today is the most targeted. Advertisers will pay more to a Facebook or Google because it can learn about you from your activity and fire ads at you that you’ll likely want to see. Of course, this raises other concerns: Won’t people become even more isolated inside their individual political, racial, religious and other silos? That is a big issue. Maybe it can be countered by ensuring that no matter what is in my special feed, there is always an option to catch other important news. Of course, it’s already happening at a user level; we pre-select the websites we will visit, the news sources we follow, the friends we accept on Facebook. But what Taneja and Maney are suggesting will take it to a different level. Back in the selfish and self-absorbed 1980s, the old joke was that magazines had gone from Life to People to Us. Soon, it was said, someone will create a magazine called Me. That wasn’t possible back then. Soon it may be literally true.